There are a couple of cool Windows tools for getting detailed system information and monitor temperatures and S.M.A.R.T. Some built in Windows tools are systeminfo.exe (run in cmd: systeminfo > file && notepad file) and msinfo32.exe. 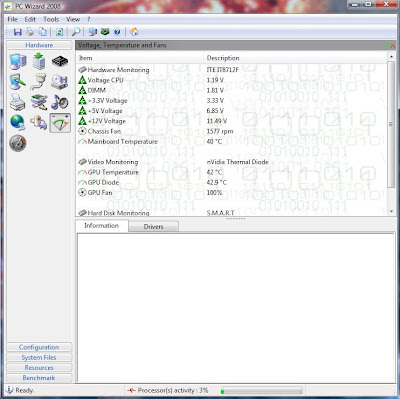 A cool free tool is PC Wizard 2008 from CPUID (makers of CPU-Z). There is also AIDA32 and SiSoft Sandra which give detailed system information and can perform various benchmarks. BgInfo from SysInternals is another interesting tool that displays systems information as part of the wallpaper background. It's quite nice if you're part of a large network and need to quickly identify what system you're on and easily view various network settings. It's somewhat similar to torsomo on various *NIX systems.